Community Builders is a tuition-free program for rising 10th-12th grade students from Albuquerque Academy and other area schools. The program gives students an opportunity to learn the nuts and bolts of community philanthropy and nonprofit organizations, and includes a mix of site visits and meetings with community leaders. At the end of the program, students come together as a mock foundation to make decisions about how to support some of the nonprofits they studied, both financially and through volunteer work. Through generous gifts from the Bonafair Fund for Community Leadership and Drs. Nancy Croker and Joseph Gorvetzian, participants are given $10,000 to allocate among the studied nonprofits. 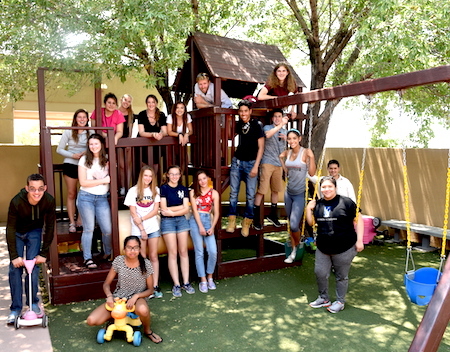 Since its inception in 2003, more than 100 nonprofit organizations and community leaders have participated in the program, including Alta Mira, PB&J Family Services, Roadrunner Food Bank, Very Special Arts of New Mexico, ACCION, St. Martin’s Hospitality Center, Ronald McDonald House, Special Olympics, WESST, and MADD. So far, more than 200 student participants have allocated $120,000 to local nonprofits. For more information about the Community Builders program, please contact Consuelo Gonzales (980-2139). Albuquerque Healthcare for the Homeless–Art Street; Albuquerque Opportunity Center; Comanche Elementary School Social Action Kids; PB&J Family Services, Inc.; St. Anthony’s Pharmacy; UNM CASA Runaway & Homeless Youth Program. All Faiths Receiving Home; APS Title I Homeless Project; Cuidando Los Niños; PB&J Family Services, Inc.